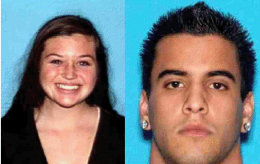 18 year old Kyndall Jack and 19 year old Nicholas Cendoya have been missing since Easter Sunday, March 31, 2013 when they went hiking in Southern California’s Cleveland National Forest. Cendoya and Jack vanished near Holy Jim Canyon, calling authorities for help Sunday evening before their cellphone died. Wednesday night, One of two missing hikers was found alive in Southern California’s Cleveland National Forest. 19 year old Nicholas Cendoya was rescued at about 8 pm at the bottom of a steep ravine, barefoot and wearing shorts. He was airlifted to a hospital 20 miles away in Mission Viejo, CA in serous condition, delirious and severely dehydrated. However, the whereabouts of missing 18 year old Kyndall Jack is still unknown. One of two hikers missing since Easter Sunday in Southern California’s Cleveland National Forest was found alive Wednesday night, but his companion remained missing, a sheriff’s spokesman said. Another hiker not involved in the search found 19-year-old Nicholas Cendoya at about 8 p.m., then told a rescue crew where to find him, Orange County sheriff’s Lt. Jason Park said. Rescuers spotted “a delirious” Nicholas Cendoya, 19, after after crews received a tip from a hiker that a man was at the bottom of a steep ravine, reports CBS Los Angeles station KCBS-TV. He was barefoot and wearing shorts, the station says. UPDATE I: Kyndall Jack , Second Missing Hiker Rescued in Orange County … Found Safe and Alive! FANTASTIC NEWS … Both hikers have now been found safe who went missing Easter Sunday. Rescue crews hoisted an injured Kyndall Jack into a helicopter Thursday after she was discovered clinging to the side of a cliff in the Trabuco Canyon area. It had been four days since she went missing while hiking with a friend, 19-year-old Nicholas Cendoya. When searchers found Cendoya dehydrated and exhausted on Wednesday night, he said they’d become separated and he hadn’t seen her recently. But on Thursday, Jack’s voice secured her rescue, after her screams caught the attention of a search team. They summoned additional rescuers and a helicopter, which eventually located the 18-year-old under a canopy of brush high on a hillside.